We are beginning our ascent in Trinity season with the basics of the Christian faith. We learned in the past two weeks that it is impossible to say we love God and to at the same time to hate our neighbour. And we will see this again and again during this season – the love of God and the love of neighbour are intimately bound – and we will see that a sin against God has its outward manifestation in a sin against our neighbour. We are shown this so clearly in today’s Gospel. The Son of God comes down from heaven and is Incarnate in Jesus Christ. He draws the Publicans and sinners to him. And Jesus teaches them the way of truth – calls them to repentance, and speaks the words of forgiveness that they long to hear. Having met Jesus they know themselves to have been lost without Him and that they have been found by God. The Scribes and Pharisees, on the other hand, who study the law, who seek to be faithful to it in outward ways, are drawn to Jesus, but only to find fault with Him. They don’t see themselves as lost and found by God. They manifest their sin towards God by their reaction to their neighbours and to Jesus. They are full of pride. They think themselves better than the Publicans and sinners (perhaps because they are better at following the law, or at least some parts of the law, outwardly) and they think themselves better than Jesus, because he associates with Publicans and sinners. Do you see how a sin against God has an outward manifestation as a sin against neighbour? So we can look at our relations to others to know how we are relating to God. The Scribes and Pharisees think themselves to be better than their neighbour and even better than God incarnate. Do we see this sin manifesting itself in us? Many years ago, having strayed very far, I was brought back by Jesus to God – I was given faith, but I was still very eccentric in many of my beliefs, I still had my own ideas about many things (I pray that my faith is now less and less eccentric). While praying daily and reading the Bible privately, I stayed away from the Church for a few years, thinking that if I went into the Church my faith would be ruined. But I went on a long trip to discern God’s will (I believe at the nudging of the Spirit). I was in Spain in a small village at the base of a mountain and went up to the top for a hike. On the way I passed through a flock of sheep, and finally at the top of the hill there was the ruin of a castle. There was only one room still left intact and it had an opening in the wall. When I looked in, there was a lamb standing there that had strayed from the flock. I thought I should get it back to the flock, it seemed lost, so I chased it outside and then back to where the other sheep were, and sat down to rest and watched it for a while, from a distance. And I saw it again, moving away from the flock – and I felt concern for it. And suddenly I had an overwhelming sense of God saying – That is how I feel about you! It was after that that I began to look for a church to join. Each of you know something of this experience – especially if you are parents. Do you know the experience as you watch your children growing up? 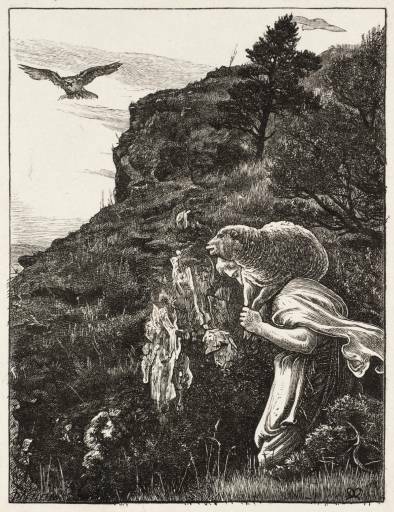 Do you know that experience of seeing them from a distance and being concerned that they seem to be just on the edges, not willing to draw near but seeking their own way – I don’t mean in relation to their work or choice of spouse, things they must figure out for themselves – but in relation to God, just lingering on the outskirts of the flock? And what about you and I? Do we continue to hold to peculiar positions? Will we submit ourselves fully to Christ, recognizing the pride that is in us, that could sever us from Him, forever? Do we have a partial commitment or will we fully submit ourselves to God? Will we test our ideas about God and the soul and our salvation with God’s Word written and humble ourselves under it? Will we submit ourselves to the most basic spiritual disciplines? Pride can be such a difficult thing for us to see in ourselves – it is often the air we breath. But perhaps we can see the state of our souls better by how you and I relate to other people, and the wider church with all of its struggles. Do we see ourselves as better off to stay at a distance from its ills – will we come tonight, if we can, to the regional Evensong in Lunenburg? Will we keep our eyes on the One Holy Catholic and Apostolic Church and also mingle with fellow sinners as we make our way in this wilderness? It helps for us to remember that we are here this morning not because of mere duty or what others might think of us if we didn’t – but because we are lost sinners who have been found by Jesus. And we come here humbly, desiring to give God thanks, knowing our desperate need for the inspiration of God’s Word – written and made visible in the Sacrament – and our need for the counsel and fellowship and encouragement of one another. Be sober, be vigilant; because your adversary the devil, as a roaring lion, walketh about seeking whom he may devour. The roaring lion is a figure of the devil – it is a figure of the proud boaster against God (large mouth, big head!). We don’t start there, but if we linger at the outskirts of the flock, not keeping close to one another and to Christ Himself, we can be gradually drawn away further and further from the teachings and fellowship of Christ, until we come to the point where we might even, God forbid, reject them altogether. This is what St. Peter is warning us about, it is what happened to the Scribes and Pharisees who despite being in the center of the religious life of the Covenant people, departed from the heart of the Law and could not receive the Gospel when the One who fulfilled the Law perfectly was in their midst. Jesus tells us that there has been joy in heaven that each of us has been found by Him and brought here today. Let us now join in with that joyful celebration in heaven as we draw not away, but ever closer to the heart of that great feast in heaven. All of us desire greatness – and our autonomy, to do it our own way – it is in our very nature to want greatness – but greatness, Jesus tells us, is only found in humbly submitting ourselves to one another and to God. that he may exalt you in due time. Amen.